Another of our favourite local venues – The Old Parish Rooms, Rayleigh – was the setting for Alex and Jan’s wedding on Saturday 1st September. This was such a pretty wedding cake! 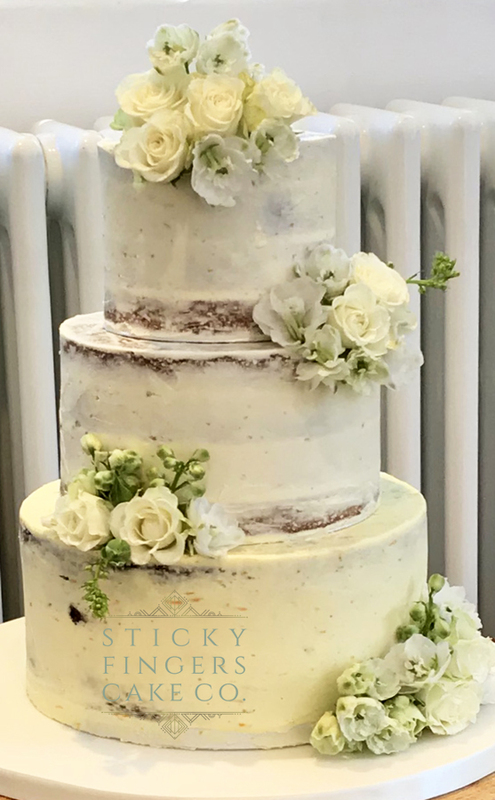 Their 3 tier semi naked wedding cake was decorated with cute ivory spray roses, white Alstroemeria and white delphinium supplied by their florist, you really can’t go wrong with a white and green colour scheme! The flavours they chose for their wedding cake were Carrot & Pecan for the bottom tier then 2 tiers of Zesty Orange on top – Yum! Sending you both huge congratulations on your very special day!